The word is “touchpoint.” And if it isn’t important to you now, it probably will be: Virtually unused 10 years ago, the phrase has entered the customer experience lexicon in a big way. 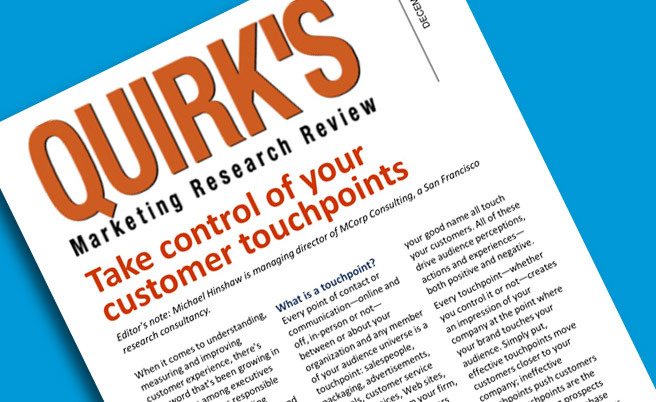 In his August 2010 Quirk’s article (“The road ahead for marketing and advertising research”), John Wittenbraker identified touchpoints as an “emerging trend” and noted that familiarity with the concept of touchpoint effectiveness isn’t as strong as for other research methodologies. Every point of contact or communication—online and off, in-person or not— between or about your organization and any member of your audience universe is a touchpoint: salespeople, packaging, advertisements, manuals, customer service centers, invoices, Web sites, text messages from your firm, catalogs, thank-you letters and even your products. But it’s not just corporate touchpoints, as described above. Many touchpoints which have a profound influence on your customers are outside your direct control. For example, wordof- mouth, bloggers and the media, distributors, resellers, retailers, outsourced customer service or marketing “partners” who sell under your good name all touch your customers. All of these drive audience perceptions, actions and experiences— both positive and negative. Every touchpoint—whether you control it or not—creates an impression of your company at the point where your brand touches your audience. Simply put, effective touchpoints move customers closer to your company; ineffective touchpoints push customers away. Touchpoints are the levers for driving prospects through your pre-purchase life cycle, creating customers. They’re also what drives customers through the post-purchase lifecycle, increasing satisfaction, loyalty and advocacy. In a company of scale, it is easy to allow a discussion of touchpoints to descend into paralyzing complexity. We regularly work with companies whose touchpoint inventory reaches into the hundreds—and occasionally into the thousands. When external touchpoints (outside corporate control) are brought into the mix, it can get even more confusing. You need a way to sort through the possibilities. Human: A real person represents your company, either face-to-face (i.e., retail or personal sales environment), over the phone (i.e., call center or customer service) or online (i.e., chat). We refer to these as bi-directional touchpoints; information flows two ways. Interactive: These multidirectional touchpoints go through one or more devices that process and/or transmit information, such as a Web site or interactive e-mail. Static (dumb): Including ads, catalogs, physical buildings, signage and even certain products, static touchpoints transmit information one way, putting the burden of response on the customer. They will respond but only if the touchpoint is relevant to their wants and needs. Such a touchpoint is considered dumb if it can’t process and/or transmit information. Though only one of several lenses deployed in the understanding and improvement of customer experience, touchpoints have a power that many companies underestimate. We’ve established that touchpoints actively influence customer behavior and perception in ways that are either beneficial to your company, neutral or negative. What gets slightly more complex is the degree to which one touchpoint influences desired behavior more effectively than another or how different touchpoints, encountered or sequenced in different ways, will influence one audience segment more effectively than another. From a research perspective, an understanding of influence begins with what we term touchpoint-level data as reported and experienced by customers and as understood by teams within a company. When it comes to influence, do internal and external views of touchpoint efficacy align? Do gaps in perception point to opportunities to save or reallocate resources, improve experience or change perceptions? And that’s where control comes in. As touchpoints proliferate across digital and user-driven channels, traditional corporate control over them wanes. Today more than ever, many decisions are made outside the realm of corporate influence. The simplest way of classifying the control of touchpoints from the corporate perspective is binary; you control them or you don’t. In theory, your company controls touchpoints such as your sales force, advertising and Web presence. You may or may not control the way that partners or your distribution channel touch your customers, and you don’t control word-of-mouth and third-party touchpoints, which can have a high degree of influence over your customers. It’s no secret that the ways customers interact and gather information about your company are changing. Businesses or consumers, they demand more and get it from more places than ever. Even so, many companies don’t have a clear picture of all the ways they touch their customers, much less the ways that others do on their behalf. Yet these touchpoints are the frontline when it comes to delivering customer experience. Even within the context of a broader, corporate initiative around improving customer experience, this lack of knowledge about your company’s touchpoints means that you tacitly (and usually unconsciously) are ceding control of the touchpoints that influence customer experience, and perception of your brand. The question your company should ask this is: Will you control your touchpoints or will you allow them to control you? The importance of touchpoints—understanding them all, controlling those that you can, and influencing those you cannot—will be a defining factor in delivering a better customer experience, building stronger relationships and driving loyalty in the years that come. The bottom line is simple to understand, though I recognize a lot of work to execute: Companies must evaluate the ways they touch, influence and serve customers. Without an understanding of customer experience at the touchpoint level today, it’s difficult to prioritize opportunities to improve customer experience tomorrow. Once this understanding is gained, you’ll have the tools you need to begin controlling the touchpoints you can and influencing those you cannot control. Author Michael Hinshaw is the Managing Director of MCorp Consulting, and an innovative executive, consultant and educator. His firm’s trademarked approach to quantifying and improving customer experience – Touchpoint Mapping – transforms the ways companies interact with their customers. A former public company CEO, he’s helped many companies – from fast-growth market leaders to the Fortune 500 – get closer to their customers and employees, and profit significantly as a result. Michael can be reached at 415-526-2655 or contact us online.